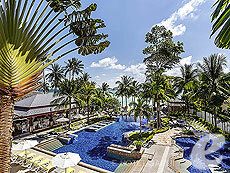 A well established beach resort which is in a relatively quiet area on the north side of Chaweng beach. The resort is large and has 2 parts separated by the beach road. Each area has a big swimming pool. One of the appeals of this hotel is its excellent location, within walking distance to shops and restaurants. 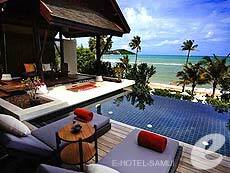 Opened in 2008, Villa Lawana is a beach front resort located at north of Chaweng Beach. (Next to Nora Beach Resort) The owner of the resort also owns “Lawana Resort” in Bophut area. The buildings and facilities are designed in Chinese style. All the guest rooms are spacious, and some villas offer a private pool. The large swimming pool in front of the beach gives you a feeling of luxury. 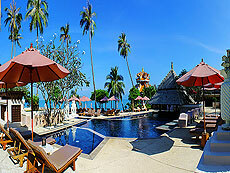 Opened in 2003, Baan Haad Ngam Boutique Resort is a quiet resort located at the northern end of Chaweng Beach. 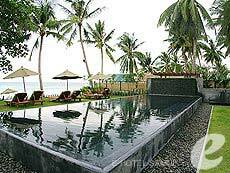 The resort offers reasonably prices rooms and luxury villas near the ocean. It is about a 15-minute walk to the center of Chaweng. A shuttle service is available for your convenience. 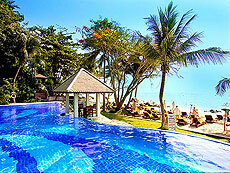 Banana Fan Sea Resort is a popular resort located in the center of Chaweng Beach. It offers 12 types of rooms to suit your needs and budget. The hotel is ideally located within walking distance to the beach, restaurants, and shops. 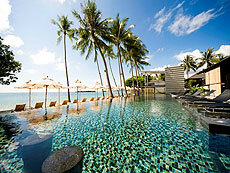 Bandara Resort is a stylish beachfront resort on Bophut Beach. The property is rather long, and has two buildings on the both sides which surround the main swimming pool and the gardens. You will be surrounded by lush greenery, and get nice breezes blowing off the ocean. The resort offers 138 bright and modern rooms. The villas near the sea offer a private swimming pool. This is a ideal resort for couples and families. 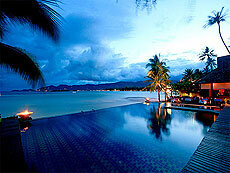 Bhundhari Spa Resort & Villas Samui is a new luxury resort located between Chaweng Beach and Choeng Mon Beach. 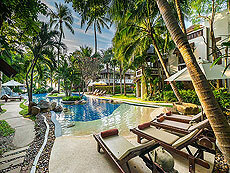 The resort is designed in traditional Thai style with a touch of modern luxury. The resort is divided into two sides by a road, Beachside and Hillside. Enjoy sunbathing on the beach, or stunning panoramic views of the sea. to Beach In front of Chaweng Beach. 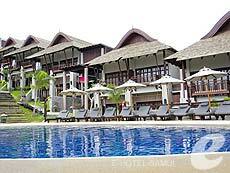 Chaweng Regent Beach Resort is a popular hotel located in the central area of Chaweng Beach. Set in a large tropical garden, it offers comfortable rooms and bungalows, relaxing spa treatments, and refreshing swimming pools. The hotel is only a short walk away from the center of Chaweng, yet quiet and peaceful. In the evening, many restaurants and bars open on the beach; you can enjoy strolling along the beautiful waterfront to find a place you like. Fair House Villas & Spa (former Ban Laem Sai) is a beachfront resort, which opened in 2006, on a peaceful cape between Bophut Beach and Mae Nam Beach. There are 78 guest rooms in total ranging from standard rooms to luxurious villas. Guests can enjoy the quiet beach and the beautiful sunset. The hotel is especially recommended for couples who wish to spend a romantic holiday. 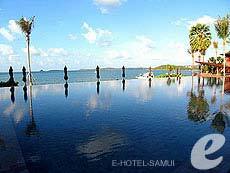 Newly opened in 2010, Hansar Samui Resort & Spa is located adjacent to the vibrant \"Fisherman\'s Village\" in Bophut Beach. The hotel is facing the sea, and all rooms have a large private balcony with views of the sea. 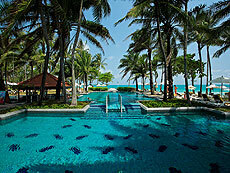 The hotel also boasts an infinity edge beachfront swimming pool and high quality resaturants. 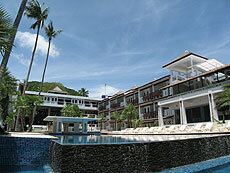 Impiana Resort Samui is located on Chaweng Noi Beach, which is separated from Chaweng Beach by a small rocky headland. The quiet beach offers excellent snorkeling during the high season. The hotel features a beachside swimming pool, luxury spa, and sea-view restaurant. The resort assures you a relaxing stay. 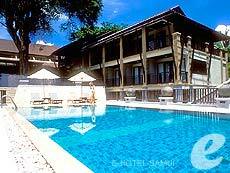 It is located just a 5-minute car ride from Chaweng Beach. Jamahkiri Boutique Resort & Spa overlooking beautiful Shark Bay is a luxury resort located on the southern coastline of Koh Tao Island. This is the only hotel on the island which offers a fully equipped spa. A new hotel wing with more reasonably priced rooms opened in 2009. Only accessible by hotel’s four-wheel drive vehicles, Jamahkiri Boutique Resort & Spa is a real hideaway. 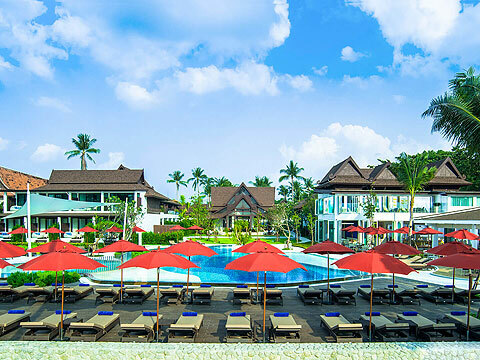 Kandaburi Resort & Spa is a new resort located in the quiet northern part of Chaweng Beach. There is a large garden between the two buildings to relax and enjoy the fresh wind from the sea. The beach in front of the hotel is good for swimming, as the off-shore reef provides natural breakwater, and the water is calm even during the windy season. Opened in July of 2008, Koh Tao Montra Resort is a luxury beach resort within walking distance of Mae Haad pier, gateway to Koh Tao (Tao Island). 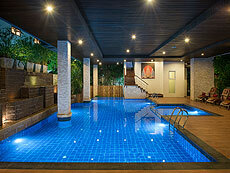 It offers modern designed rooms and swimming pool for diving lessons. It is located on the beachfront and within walking distance of the town. Whether you enjoy diving, snorkeling or simply enjoy relaxing on the beach, you will have a wonderful holiday at the resort. 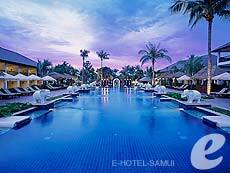 Muang Samui Spa Resort is a luxury beach resort located in the heart of Chaweng Beach. The elegant traditional Thai style buildings are impressive. 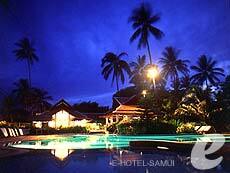 The resort is well designed with tropical greenery and a small stream along the pathway to the swimming pool. The resort also offers luxury spa facilities. Pamper yourself with a luxurious treatment in the private treatment room. Guests staying in the Royal Suite also can enjoy spa treatments at the outside sala (or pavilion) in your private garden. The hotel is just a minute’s walk from downtown Chaweng. 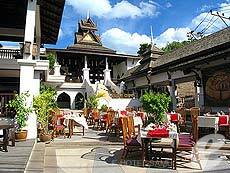 New boutique hotel, Nora Chaweng Hotel is located in the quiet northern part of Chaweng. This affordable hotel, which is managed by the same manager as “Nora Beach Resort & Spa”, offers white-themed modern and clean rooms. It is just minutes from the bustling center of Chaweng with a lot of options for dining, shopping and nightlife. 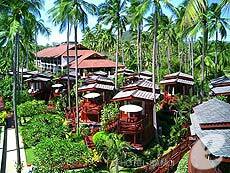 Panviman Resort Koh Phangan is located in the scenic area on the north-eastern part of the island. Built on a cape, the hotel offers stunning views over two beaches. The luxury villas are surrounded by the blue sea and lush greenery. 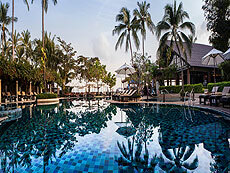 Peace Resort is a nice middle class resort at Bophut Beach. 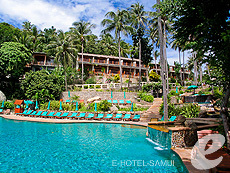 This resort is managed by Thai owner, and offers good facilities at an affordable rate. Guests can relax in a homely atmosphere. 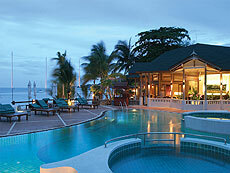 The resort features a beautiful beachside swimming pool, a beachfront restaurant, and villa style accommodation. Some villas have a living space, which are suitable for families. The resort completed a major renovation in 2018. 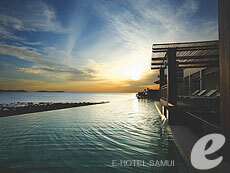 Opened in 2003, Q Signature Samui is a luxury sea view resort located on the east side of Choeng Mon Beach. In 2007, new pavilions, “Superior Pavilion” and “Deluxe Pavilion” are built on a little hill. All units are luxuriously decorated and equipped with a kitchenette. Some villas offer their own private pool, which are ideal for families and honeymooners. 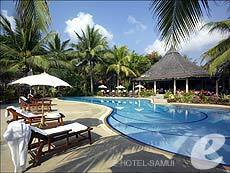 Sala Samui Resort & Spa is a luxury beach resort located on pristine Choeng Mon Beach. The white-themed beach front villas offer an elegant atmosphere. 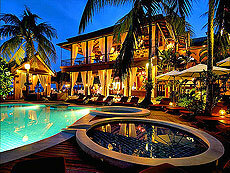 The resort features private swimming pools in 53 out of 69 total villas and suites. It is very popular with honeymooners and couples. 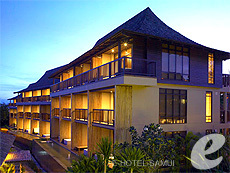 Sareeraya Villas & Suites opened in 2009, in the northern part of Chaweng Beach. There are many restaurants around the resort, and the beach and shops are also within walking distance. The resort offers quiet location and spacious rooms to relax. It is recommended for couples, families, and small groups of friends. Shasa Casavela Koh Samui opened in 2008 on the west coast of Koh Samui. All rooms are very spacious with a kitchen, well equipped, and have a sweeping view of the sea. The hotel also offers a wide range of facilities including 3 swimming pools, kids club, fitness center, and spa. Perfect for family vacation. 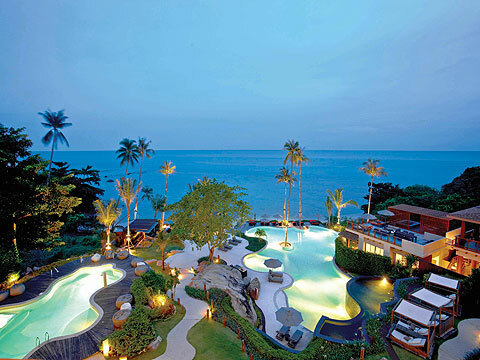 Silavadee Pool Spa Resort is a luxury resort located on Laem Nan Beach, just north of Lamai Beach. 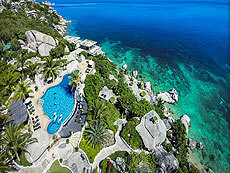 Being on the cliff, the resort offers sweeping views of the ocean. All villas are warmly and elegantly designed with teak wood. This is a perfect resort for honeymooners and couples. 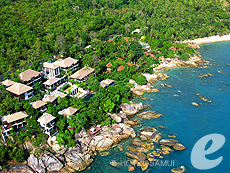 Located on a cliff between Chaweng Beach and Lamai Beach, the Kala Samui offers all-sea-view rooms and villas. The rooms are tastefully decorated with natural materials. The hotel also has fully equipped spa facilities. to Beach A 5-minute drive to Chaweng Beach.